"The New River Trail 50k is to be a green event because Annette believes that all people, especially those of us who run in the woods (or mountains or desert) need to do what we can do to promote sustainable recreation in our outdoor and wild places. Even though we are a fringe sport, we can influence others to make good decisions when selecting products and behaviors that will be in good conscience hopefully move common practices of our sport." I don't remember how I heard about this new race created by Annette Bednosky, but I spent only a day or two back in May making my decision to enter it. 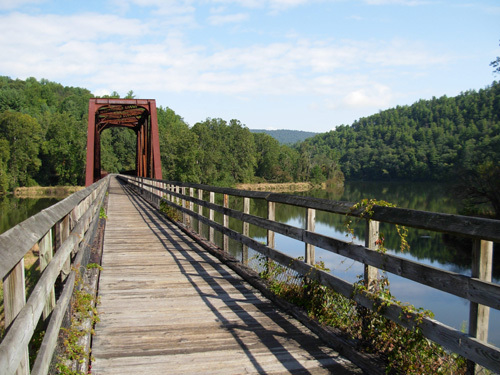 The web site enticed me; I liked the concept and the venue seemed perfect for me: a flat, smooth, scenic 50K in October on the beautiful New River Trail just a couple hours south of our home in Virginia, directed by one of the best female ultra runners in the country. How could I go wrong?? 1,089-foot long bridge over the New River at Fries Junction. It wasn't until a few days after I registered on-line that I realized I, um, might have a bit of difficulty finishing it within the allotted seven hours! Oops. Another challenge for an aging runner. After plunking down a fair sum of money to enter this race, it became my secondary goal race for the year (my primary goal is a good showing at the 24-hour run on December 31 at Across the Years). I had become a plodding slug for several months after last year's ATY race, trying to save my remaining knee cartilage for only races that really matter to me. Now instead of practicing my run-walk strategy and slower pacing for ATY, I needed to prepare myself for the faster, steadier pace I'd need to do to finish the NRT 50K. Hopefully, that will also help me at ATY. Distance isn't my problem, speed is. That's a constant that hasn't changed since I began running 29 years ago. I'll find out in a couple of days if my training for NRT was sufficient. 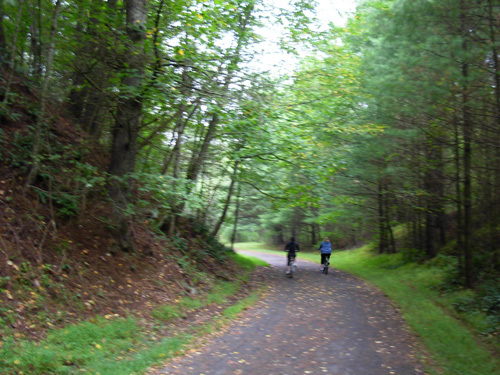 Southern Virginia is blessed with two superlative long, multi-use rails-to-trails systems: the 35-mile Virginia Creeper Trail from Abingdon to Whitetop Mountain and the 57-mile New River Trail, which is a linear state park. 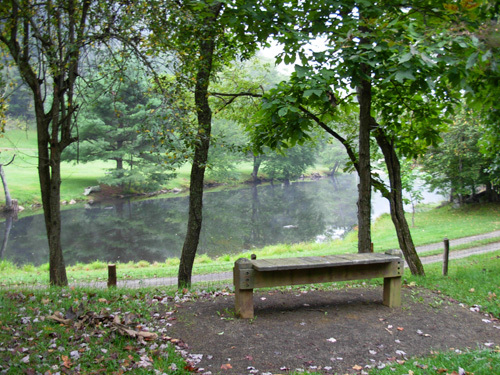 The New River Trail parallels the (very old) New River for 39 miles and the equally-scenic Chestnut Creek for about 13 miles. 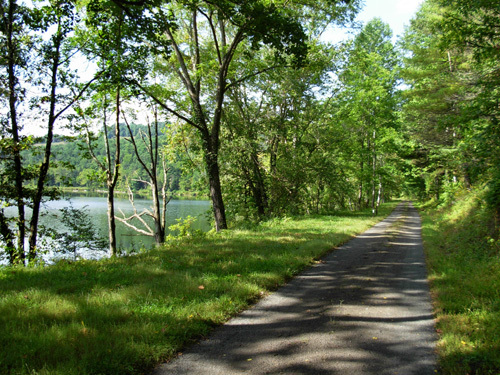 Over a mile of the NRT fronts dammed Claytor Lake near the northern terminus. When it doesn't meander between water and rocky cliffs, the trail winds through beautiful pasture land, crosses the river and creek on about 30 bridges, tunnels through two large hills, skirts a couple small towns, and passes in the shadow of the historic Shot Tower. The history of the New River is interesting. Geologists place its formation at 300 million years ago, possibly the second-oldest river in the world after the Nile. (So how come it's called "New" River and not the "Old" River?!) 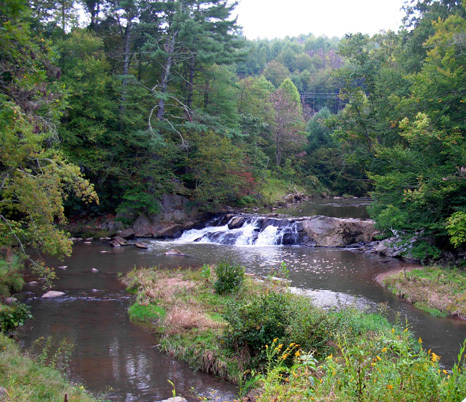 It begins in the mountains of Ashe County, NC and flows north through Virginia and West Virginia, site of the popular New River Gorge, eventually merging with the Gauley, Kanawah, Ohio, and Mississippi Rivers. 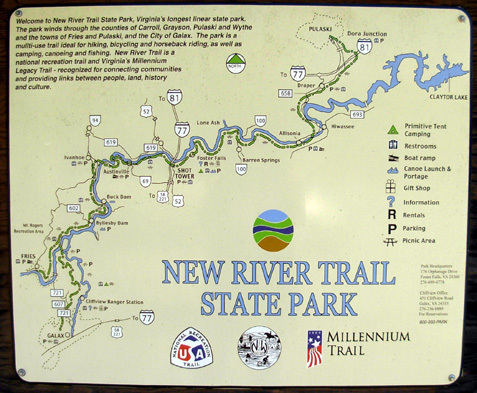 In Virginia, the New River Trail State Park offers festivals and workshops, nature and history programs, camping, picnicking, birding, wildlife photography, fishing, birding, boating, kayaking, tubing, horse rentals, and 57 miles of hiking, biking, and bridle trails. 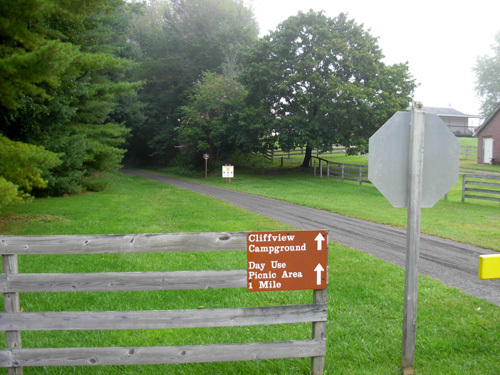 The trail's flat, relatively smooth crushed rock surface is mostly shaded and perfect for runners, walkers, cyclists, and equestrians. Two cyclists enjoy a foggy September morning on the NRT. It's also the perfect venue for a foot race. Thank goodness Annette Bednosky had the vision to recognize that and the guts to establish an ultra marathon here! (I imagine simply gaining permission from the state to hold an event in the park was a big hurdle.) The race reached its maximum of 125 runners in August. The course is definitely PR material for runners who are well-trained and a great place for runners who are new to dirt or the ultra distance to experience a long "trail" race. Flat, fast, and scenic -- what's not to like? Jim gets bored on the NRT but I love it, especially since I shouldn't be running hilly or gnarly trails any more. I haven't been able to get him to go back down there to run until recently, when we decided to go check out the course for the race. This was our first time to see the trail at the southern end of the park. I think it's more scenic than the other part we've seen, an excellent choice for the race. In the interest of saving precious time during the race, I took 87 photos during a 15� mile training run on the course September 17. That way I won't be tempted to carry my camera during the race. (OK, I'll still be tempted, but I promised myself I won't carry it.) You can see 66 of those photos on our Picasa photo-sharing site; I'll add pre-race and post-race photos to it after the race, plus any photos Jim's able to take at the Cliffview aid station. For our training run Jim dropped me off at Cliffview, where he'll be captaining the turn-around aid station during the out-and-back race. I ran northwest to Fries Junction and southwest to Fries on the inverted V-shaped course. (Actually, it's an inverted Y because on the outbound direction during the race, we will run 3/4 mile out-and-back north of the junction to make the distance 31.2 miles.) Jim drove to the town of Fries (pronounced "Freeze"), which is where the race begins and ends. He ran the outbound direction on the course, ending at Cliffview. This is where Jim's aid station will be located at the turn-around. He promises to take some pictures here on race day. I am thrilled with this course. If I have to do a 13:27 pace for 31 miles anywhere, this is the place I'm most likely to do it. The weather forecast looks good, so I'm eagerly awaiting race day. Annette has done a magnificent job pulling this first-time race together. You can tell that from the details on the race web site and in her correspondence. She and Jim have been in frequent contact by e-mail regarding the aid station at Cliffview, sharing ideas and diagrams. In a recent letter to us and a blog entry dated yesterday, Annette shares her nervousness about getting everything right so the runners have a quality experience. We both wrote back to her, encouraging her to trust that she's done everything possible to cover the bases and to trust her volunteers to do their best to help her pull it off on Saturday. Race directing is a huge responsibility, one that neither Jim nor I have ever wanted to tackle. It's enough stress to captain an aid station! We have faith in Annette, her husband, and everyone associated with the race that it will be a very successful and memorable event. I'm guessing it will fill up even faster next year. 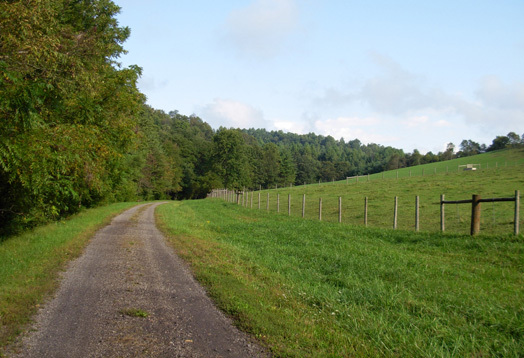 Expect to see a herd of cows at the "Triple C" farm. Runners are even asked to bring their own bowl and spoon for the homemade soup, bread, and locally-grown apples and other fruit provided after the race. That's cool. The course won't be as "green" in October as it was in September! All race proceeds and additional contributions benefit the The National Committee for the New River (NCNR), a non-profit organization that protects, restores and educates people about one of the oldest rivers in the world. 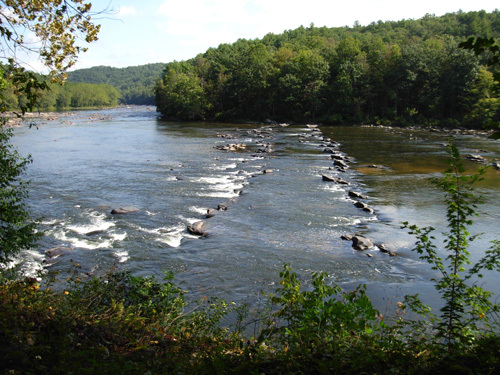 NCNR works in all three states (North Carolina, Virginia, and West Virginia) of the New River�s watershed. When entering the race, runners had a choice of a hand-held Nathan bottle or locally-made pottery cup. There was no question for me; I'll take something hand-crafted any time. I'm glad I chose a cup -- you can see how beautiful Pat Morrison's tumblers are in the photo in Annette's August 27 blog entry. Each finisher under seven hours will receive an attractive long-sleeved Capilene shirt from Patagonia. The women's version is a pretty, soft blue color. I have to run fast enough to get that shirt!! Awards will be presented in three unique age categories to the top two or three males and females in each group: under 39, 40-54, and over 55. Annette added the older category (the one I'm in) when she saw how many runners over 55 were registered. Thank you, Annette. There are at least five women entered in the race that are over 55. I'll be happy just to finish under seven hours. I'm not shooting for an age-group award. Award winners will choose from a variety of donated products as they finish; there isn't an awards ceremony, per se. Overall winners receive a special pottery medal. Volunteers also get to choose from a very nice array of gifts from race sponsors and local donors! Jim quickly skipped past the list of manufactured items and debated between fruit preserves and pasta sauce, both made by Annette. I think he finally chose the preserves . . . Yum! I'll get to enjoy them, too. I'm can't wait to run this race on Saturday. I'm totally psyched. Even Jim is looking forward to his role as an aid station captain. It'll be fun to spend more time with Annette and other friends who are running or working the race. I bet the course will be even prettier than it was in September. More leaves should be colorful by now. I hope I have enough spare time at the end of the race to regret that I didn't take my camera with me!